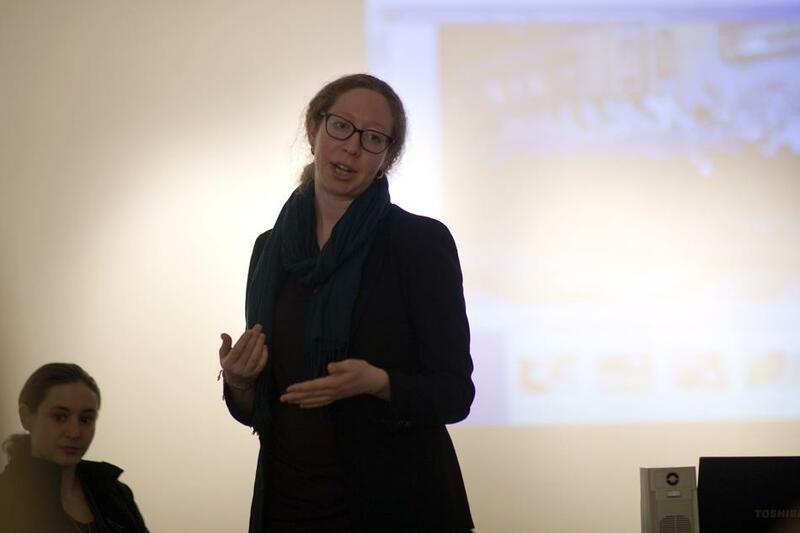 Caitlin Bruce (Weinberg ‘08) speaks at a panel discussion on the similarities between circus art and graffiti at the Evanston Art Center. She was among three other artists and scholars on the panel. Artists and scholars spoke Tuesday at the Evanston Art Center about graffiti and circus art and their lack of recognition in the mainstream art world. The panel, which was funded by a grant from Northwestern’s Center for Interdisciplinary Research in the Arts, focused on the similarities between the two art forms. Aerial acrobat Polly Solomon and NU doctoral candidate in communication studies Caitlin Bruce (Weinberg ’08) organized and participated in the panel. Bruce has been studying graffiti art in Chicago since 2010. The pair, who have been friends since childhood, wanted to unite their two interests in the event. They put together a similar panel in New York City in September 2013. The panel will be followed by a week of workshops and a final performance on Saturday. The week of activities will combine various forms of art and will be held at Alternatives, Inc., a youth activity center in Chicago. “What we’re really interested in talking about is how can these two different art traditions be put into conversation,” Bruce said in the panel. Through their work, Bruce and Solomon found graffiti and circus art to have three similarities: movement, spectacle and publicity. More specifically, Bruce said, the two forms have conflicted relationships with publicity. Gabriel “Flash” Carrasquillo, a local graffiti historian and artist, has been a part of the graffiti scene since the 1970s. Invited to the panel by Bruce, Carrasquillo said he wanted to speak because he felt it was time to tell his story. “This is like going into the vault, going into the archives that are not yet open to all the public,” Bruce said. Carrasquillo displayed photographs of graffiti he had taken in the past 10 years and described the beginning of his graffiti career. He also spoke of the difficulties of funding the art form, which Solomon brought up again in her presentation about circus art. “It’s very hard for circus to get public funding, either from grants or organizations that give money to the arts because it says in their bylaws that we do not qualify for those funds,” Solomon told The Daily. Roy Gomez-Cruz, a doctoral candidate in performance studies, also spoke in the panel about his experiences with circus art. Audience members trickled in and out during the event, but Michelle Higgins stayed the entire time. A resident of Rogers Park, Higgins said she came due to her interest in circus. “There’s just this explosion of circus in Chicago that I had not the foggiest idea about,” Higgins said. Higgins likened the event’s sparse attendance to a visual representation of what both art forms are struggling with. “Some of our larger political goals are to create more visibility for both of these art forms as legitimate art forms,” she said.